AIESEC develops responsible global leaders by delivering a practical, self-led learning experience to any student who has the drive to reach out for it. Partner with us to become an enabler of Youth Leadership Development. As an organisation, we enable our partners to access exceptional Global and Domestic Youth Talent and offer Youth Marketing Solutions second to none in the student space. We offer a number of Talent Pipeline and Youth Engagement opportunities tailored to your needs. Each year over 5,000 companies around the world trust AIESEC to provide high calibre, international student and graduate interns. Explore Physical touch points with AIESEC Members to establish your brand as a first choice employer and/or product provider among young leaders. Sponsor university students going on exchange programs with AIESEC to enable high impact experiences and gain brand recognition across 22 top universities in the UK. Global Talent is AIESEC’s premiere talent sourcing product for leading organisations, and one of the best ways in which we bring value-based leadership to the world. The programme brings youth leadership, innovation, global perspectives, and functional expertise to provide organisations with a competitive edge when it comes to talent and leadership pipeline. It involves 6-18 month placements for interns with diverse backgrounds. Our Global Entrepreneurs programme offers early stage start-ups the opportunity to connect with dynamic young talent that seek to develop by contributing to the growth of your idea. By providing your start-up with the opportunity to access our global network of young professionals, AIESEC can support you in growing your business and expanding your reach across a number of markets. Bring in a diverse team of international interns in order to help you to develop your company during short-term (6 to 10 weeks) projects. Check our Global Entrepreneurs portfolio here! Why source interns from AIESEC? Connect your company to a pool of over 100,000 bright young people from 120+ countries and position it as a first choice employer. Bring language skills and regional insights through our interns to help position your business internationally, and build great pipeline for future leadership roles. Benefit from our hassle-free and cost-effective service as all visa processes and logistical support to your company and intern are provided by us. Positively influence your company's culture, easily access talented manpower for your projects and hire our interns after their experience. Take responsibility for youth leadership development by opening internship opportunities and working hand-in-hand with AIESEC. Every Year AIESEC UK holds different conferences and events for its membership. Speak and interact directly with the members of AIESEC UK at the leadership touch points held throughout the year. Our members represent a diverse group of consumers across the 22 top universities we operate out of. What’s more, they’re all hugely ambitious and so will be high-worth clients for a while to come. Deliver 60-90 minutes Workshops and/or a 30-minute Partnership Launch on our national conferences in a close environment. Additionally, hold a promotional stand in breaks & during meal times. Participate on a local level in Campus Events and become part of our Ambassador programme where our ambassadors promote your brand throughout our 22 locations in the UK. 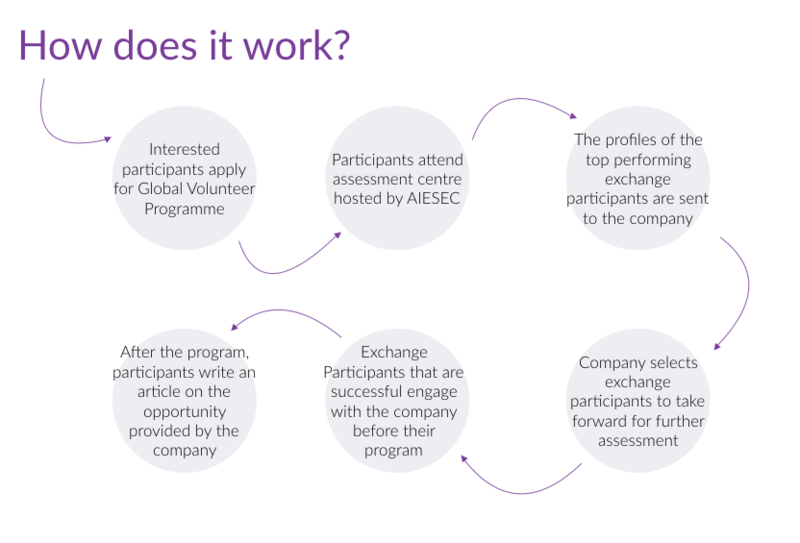 Global Volunteer programme is AIESEC’s 6-8 weeks multi-cultural volunteering project. Sponsor Global Volunteer to make the opportunity more accessible to students around the UK and drive more positive impact around the world. Find out how we can help you. 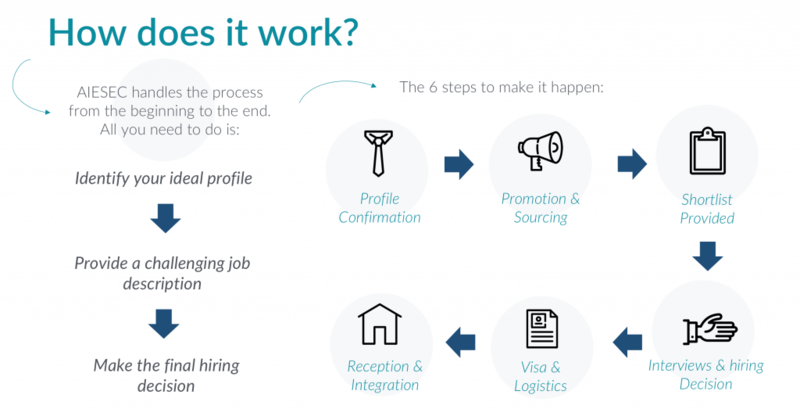 Sourcing interns or working as a corporate partner with AIESEC is simple. Fill in your business details below and an AIESEC representative will get back to you shortly.